Weekend long festival featuring original works by 21 Los Angeles-based composers and special guests exploring the theme of "Family." Each evening, 7 different composers presented or performed original works simultaneously in 7 rooms of the house for (mostly) unamplified instruments of their choosing. During each show, guests were free to explore the rooms inside the estate and discover the various performances as the evening unfolded. Sound Installation featuring spoken word from Jessica Yatrofsky, Jo Annesta and Elaine Kahn + Performance with NY Fem Factory at Pulse Art Fair Miami 2018 in Miami Beach, FL during Art Basel. The installation consisted of pink telephones that played back the spoken word artist’s words and a soundscape created for the event when the receiver was lifted. The installation featured neon designed by Dana Caputo, with creative direction by Alexis Badiyi & Jessica Yatrofsky. The ambient performance, during the Young Collector’s Opening Party, was derived & inspired by the soundscape created for the installation. For Echo Park Rising, a quad installation was set-up inside the Edendale Branch of the LA Public Library open to the public. 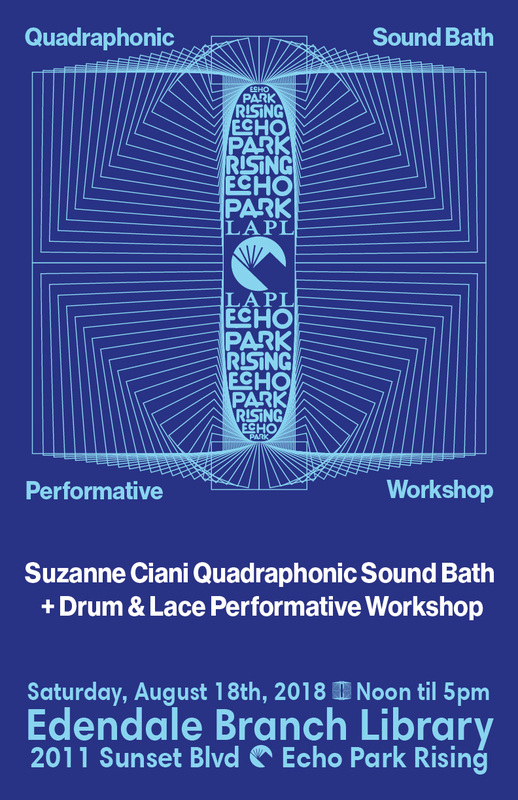 Throughout the afternoon we switched between two performances: the first being a quadraphonic sound bath with Suzanne Ciani’s most recent Quad LP (and the creator of the system Kamran V). In the second part, I gave a short workshop on immersive audio/quad, before diving into an interactive quad performance that the audience had the chance to interact with. This interaction was done through the use of 4 iPads that had the capability of triggering sounds and placing them around the four speakers of the quad setup as I performed an ambient set. This performance is scheduled to be repeated in 2019, and will include special guests and a different venue (TBA). Performance at the 2018 edition of Festa Dell’Opera, a day dedicated to opera in which the city of Brescia (Italy) becomes immersed in over 50 performances related to opera throughout the city, from sunrise to midnight, all free. The performance, called “Pelléas et Mélisande: Debussy e la Natura” ('“Debussy and Nature”), was a chill-out modern and “fluid” re-adaptation of Claude Debussy famous opera. The performance was alongside drummer and composer Michele Zuccarelli Gennasi aka Ripeti, and featured prepared drum set, field recordings, vocals and electronics. Quad Immersive and Interactive Performance at Performance is Alive x Satellite Art Show during Miami Art Week 2018. ‘soak/saturate’ is an interactive immersive quad audio performance and installation that explores this idea by allowing the listener to create their own soundscape, all while ambient textures are performed live to set the tone. Every moment of the performance installation is improvised, and no moment will ever sound exactly the same as another. ‘soak/saturate’ was created with the hope of bringing awareness to the sounds that surround us everyday, and make us aware of our sonic footprint on the environment. By using field recordings from both natural water-bound locations and from bustling cities, the listener is encouraged to test their own level of comfort and familiarity with the two contrasting-yet-coexisting environments. Composed original music for Saudade Theatre’s West Coast Premiere of ‘The Constitution’, a play by Portuguese playwright Mikael De Oliveira. The play was performed for three weekends at MiMoDa Studio in Culver City, CA. Created a soundscape for the performance of Pink Privacy, a live immersive performance that took place at the Satellite Art Show in Miami Beach during Miami Art Week/Art Basel (December 9th, 2017). Performers included artist/writer of Pink Privacy and founder of NY Fem Factory Jessica Yatrofsky, Jo Annesta, and Kyosi. With neon art by Dana Caputo and Kate Hush, installation 'throne' by Jillian Mayer. Part of Performance is Alive 2017. Original compositions for 'Becoming', a group dance performance piece performed by advanced dance students at El Camino College (CA) choreographer by Darrian O'Reilly. Performed in April 2018 at El Camino's Center For The Arts. The pieces featured electronic elements as well as voice and (field) recorded elements. Original composition for 'Odalisque', a solo dance performance piece by dancer Darrian O'Reilly, that was performed at the Tannery World Dance & Cultural Center in February 2017. The dance piece is made up of field recordings, voice, synthesizer, harmonium and electronics. An evening of ambient music, with a live performance by Drum & Lace, Alex Rose, Ian Hultquist and Justin Melland. The piece performed on that evening was based off of field recordings collected while riding the U8 U-Bahn line in Berlin as well as electronics, modular and voice. An Ambient Show 1 took place in December 2017, and An Ambient Show 2 took place in March 2017 at H Plus Studio in Los Angeles, CA. Multimedia gallery event at Nous Tous Gallery in Chinatown LA, with live performance by Drum & Lace, art installation by Amanda Maciel Antunes and Choreography by Ania Catherine. Projections, space curation and soundscape creation for the event as well as performance. "Until death it's all living"
Original Soundscape for performance art piece by Amanda Antunes using field recording, samples, and synthesizers. Performance created for Montserrat's monthly Renditions. This month's theme was Don Quixote. First performance November 15th, 2016 in DTLA. Original music for the play 'The House Itself Does Not Burn' written by Molly Haas-Hooven and directed by Stephanie C. Cunningham. Ambisonic piece outlining the sounds of The Highline in NYC over the course of a full day. The piece was created for World Listening Day 2011 to bring awareness to the sounds that surround one in the city. Recorded in B-Format and decoded to Ambisonics for 16-channels using Max MSP.